A subtle health-care reform is taking place one filliform needle prick at a time. SLC Qi is a community acupuncture clinic, where multiple patients are seen simultaneously in the same room. This helps with the goals of affordability and accessibility. The clinic charges fees on a sliding scale, from $15-$40 per treatment. While the practitioners say it’s not a replacement for Western medicine, acupuncture has been known to help those who suffer from arthritis, migraines, depression and more. That’s a potent bunch of little pokes. Independent record stores can seem intimidating, as seen in the film High Fidelity. Lucky for us, Slowtrain Records is anything but. If you need affirmation that you have excellent taste in music, buy a record when Matt Hoenes is working. He will invariably commend you on your “good choice.” Each and every one of the four staff members—including Vanessa Wardy and owners Chris and Anna Brozek—are friendly, knowledgeable and not elitist in the least. They will special-order records, guide you through the massive selection of music and help you decide which album is really a good choice. 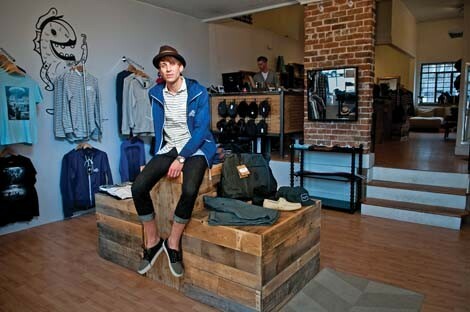 A small, modern clothing boutique in the heart of the 9th & 9th shopping district, Fresh has carved out a niche with its unique selection of merchandise from the likes of Coal, RVCA, Alternative Apparel, Insight and Ambiguous. The shop also includes hand-picked pieces from smaller and more-specialized labels displayed alongside an impressive selection of shoes from the ever-increasingly popular TOMS. But most notable is Fresh’s collection of Obey, the iconic clothing brand that uses a stencil of the late Andre the Giant as a label, founded by street artist Shepard Fairey—best known for his “Hope” Obama posters. This self-service auto recycler is operated by Chris Mantas and his family. They take pride in running a clean, organized yard, and they actually warranty their parts. They have a wide variety of vehicles arranged in aisles and up on blocks, making it easy for customers to access the undercarriage and pull the parts they need. Customers place the parts in a wheelbarrow and bring them to the checkout stand, just like in a grocery store. After the vehicles are stripped, Tear a Part disposes of them by draining the oils and fluids and removing all mercury switches, AC gases and batteries. Then they dispose of potential hazards in an EPA-approved manner. Their environmental stewardship puts them in good standing with the EPA. Finally, a salvage yard that gives you warm fuzzies! The married duo of Melissa Christensen and Patrick Bogdanich branched out from Koi Piercing to take over the empty space next door, transforming it into a small fashion boutique on the corner of 900 East and 1300 South. The two shipped in trend-setting fashion both local and from around the country, ranging from finely stitched dresses and designer earrings to fishnets and garter belts, and displayed them at affordable prices for the public at large. Almost overnight, Tempest has become a hotspot for unique and sometimes risky debut fashions. If you’re homesick for South America or Mexico, or if you just want to find the largest selection in Utah of Latin American produce and meat, this is the place. The meat counter alone is 90 feet long, with bargains like cooked pork ribs for $3.99 a pound. Tenochtitlan stocks more fresh peppers than you ever knew existed, along with white and red corn for pozole, a dozen different kinds of yerba mate, and the fresh bags of cellophane spices that have all but disappeared from the major supermarkets. One section is a restaurant, with mariscos and a taqueria, plus housemade menudo on weekends. More than a spa and salon, the new 7 Club offers private locker service, HCG weight-loss programming and personal training through the 24 Hour Fitness located in the same building. That’s in addition to all the usual spa offerings like facials and waxes. Tucked away in Trolley Corners, 7 Club offers the perfect shower away from home for busy business people or an antioxidant pumpkin exfoliator treatment for when you are wearing the weight of the world on your face and need it scrubbed off. Don’t know jack about floral arrangements? No big deal—just don’t grab a bouquet from the grocery store. Instead, go to The Art Floral, which has been beautifying Salt Lake City for 60 years. From helping you select apology flowers and bridal bouquets to decorating your entire home with exotic flower displays, the staff will work with you (and your budget) to fulfill the floral desires you didn’t even know you had. A new visitor to this bookstore might not realize that this is version 3.0 of the Ogden institution, recently relocated to a new space. The store’s huge interior is lined with books that look as though they’ve sprung organically from the walls and shelves—a vast hodgepodge of recent fiction, vintage mysteries, classic kids books, as well as comics, videos and games. After a stop at this store, you’re gonna need a bigger bookshelf. There are few better places in the state to help accessorize your favorite lover of words, from Scrabble-tile earrings to quotable refrigerator magnets. But raging bibliophiles might really love being able to fill their curio cabinets with figurines representing literary giants. Pick up the Jane Austen (complete with writing desk! ), Edgar Allen Poe or William Shakespeare, and supplement the gift with other great items celebrating those legendary authors. Sugarhouse Dental Spa specializes in making teeth cleanings as comfortable as they can be. Neck massages help clear the tension from opening wide, and paraffin-wax hand treatments ensure that your hands will leave feeling as soft as your teeth are clean. Dr. Kirkland Graham and the crew recently moved the operation down the road for an even plusher experience. Most bands don’t have the money or the resources to put together a music video of their work to help get their name out. So a small production company dedicated to that notion has been a blessing to the music scene. The small outfit (which includes Velour’s Corey Fox) has produced videos for Isaac Russell, Shark Speed, Joshua James, Parlor Hawk and Neon Trees, giving the bands a YouTube presence and helping establish Utah music in the Internet age. Moving is stressful enough for everyone involved, never mind the time spent rounding up boxes and wondering if all that packing material is going to wind up in a landfill. The Other Box has come up with an alternative to the traditional cardboard solution: Reusable, recycled plastic packing boxes that the company will deliver to your door (for free in Salt Lake City) and retrieve when you’re done. You can even get biodegradable packing peanuts and bubble wrap to help with the fragile items. Nestled in the heart of West Jordan, Drake Family Farms has been a mainstay of responsible and wholesome agriculture for six generations. At its Willow Lane Soap Cottage, purveyors offer the best in goat-milk soap products. Before you say “bah!” to the idea of goat-milk soap, remember that for thousands of years, goat milk has helped to make a natural moisturizing soap, packed with good stuff like vitamins—not bad stuff like pesticides or other chemicals. These are all good reasons to shop natural, shop local and get your goat milk on. It may be a luxury nowadays to have milk delivered, but one Utah family dairy has kept the dream alive for six generations over 130 years. Not only can you have all-natural milk (in returnable bottles) delivered to your porch each week by Winder Dairy, but you can also receive bakery products, produce, juice, meats and cheeses. And all this pampering is mostly guilt-free. First, congratulate yourself for contributing fewer plastic jugs to the landfill and burning less gas driving to the grocery store. Second, feel the love from the local food producers whose products are delivered by Winder: Tooele County eggs, Cache Valley jams, Lehi Roller Mills pancake mixes, Weber County bread and, of course, all that milk that comes from Summit and Wasatch county cows. The rate of technological change has plenty of people upgrading cell phones faster than their service contracts can expire. All that old gear could end up in a landfill, but entrepreneur Paul Evans thought there was a market for buying back those older phones and re-selling them to buyers looking to upgrade their own phones at a bargain price. At kiosks in five Utah malls—plus more states being added all the time—you can buy or sell used phones, or even get phones (and iPods) repaired rather than making them one more part of disposable culture. It's hard to find a local place that can repair and clean all your timepieces, from large chiming wall clocks to watches. Don’t suffer through a series of incompetent, outrageously expensive stores—just go straight to O.C. Tanner. If the repair is physically possible, they can do it, and for a reasonable price. The outlet also offers golf clubs, telescopes and crystal, but it's the excellence of the work on timing devices that makes this store a real find. Since Whole Foods Trolley Square opened in mid-March, foodies have flocked to this sumptuous grocery store for a near-religious experience. Many choices abound, but the real treat is the pay-by-the-pound dining options. For breakfast, Burt’s Big Bowl is a steal at $2.99 for make-it-your-way oatmeal. Later in the day, the salad bar—with both organic and conventional produce—has doubled in size for crafting the perfect green mix. The drool-inducing hot bar expanded from three trays to over 30 housemade options—rotated daily—from Asian fusion to modern American. The hard decision isn’t whether to visit the new digs, but where to dig in. Ah, the good old days—when families gathered around the table to play board games, mom served mixed nuts and gin & tonics at neighborhood parties, and dinner every night was a casserole. If watching Mad Men has left you jonesing for this kind of life, stop by Retro Rose, a kitschy secondhand store that’s conveniently color-coded, so you won’t have to look far for your matching powder-blue rotary telephone, cookie canister and cocktail glasses. “Adventure’s First Stop” may be Maverik’s company slogan, but for knowledge lovers, the 600 South Maverik is trivia’s first stop. For no charge, this Maverik offers patrons the chance to beat the daily trivia question and win a tasty candy bar. It doesn’t matter that the trivia questions are so random and encyclopedically obscure that they would stymie Ken Jennings on a good day, it’s just nice to see a little character reflected—at least at this station—by an otherwise corporate gas Goliath. Are you heading for that trip down the aisle, a special event that begs for a bauble, looking for an anniversary necklace or a make-up bracelet because Vegas didn’t stay in Vegas—or do you just plain want to spoil yourself on a beer budget (despite your champagne taste)? Well, maybe a high-end whiskey budget, but you get the point: At AAA, you’re not going to pay through the nose for that perfect diamond or piece of silver or gold that will mend all of the above and also save you some green in the process. Much of the inventory comes with a built-in memory, but you’d never know. Also, if discreetness is important, just set an appointment for next door at Michael Angelo’s Jewelers (cleverly named after brothers Michael and Angelo, natch), where you can gaudy up in total privacy. While you’re there, sell them your gold. These fellows love to buy the real heavy stuff. 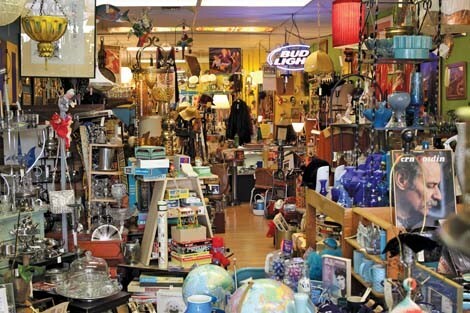 From sofas to scissors, everything Earth Goods sells is eco-friendly. 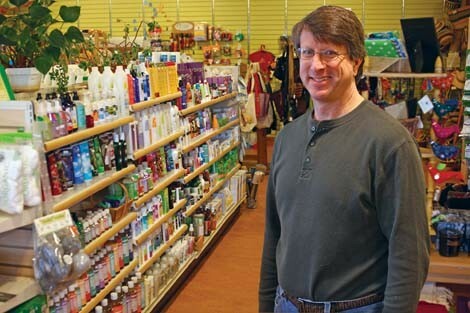 Customers can find just about everything for their body, kitchen, office and home, just as they would at other “regular” stores, but here, each product is rigorously researched and scrutinized to meet Earth Goods’—and, founder Tom Benedict (pictured) would argue, Earth’s—quality standards. Earth Goods doesn’t just sell eco-friendly products; it has a sustainable mission. It minimized its ecological footprint as much as possible when remodeling the store three years ago and adheres to green initiatives during day-to-day operations, like recycling byproducts, minimizing resource consumption, buying 100 percent renewable energy for power and more.